The Raspberry Fly is a multirotor drone. This simply means that it has multiple rotors which it uses both as propulsion and as a means to stabilize in the air and control its heading. The most common drones are tri, quad, hexa and octocopters. The main differences between these types are the number of motors and how you apply adjustments to the motors in order to accomplish the desired change in the drones position and speed. The Raspberry Fly is a quadcopter, but most of the information on these pages can be applied to other designs relatively easy. The frame is obviously a very important part of the drone. If the frame isn't stable the drone won't be either. You can design and build an airframe from scratch if you like, but there are many good kits available as Almost-Ready-to-Fly (ARF) kits. 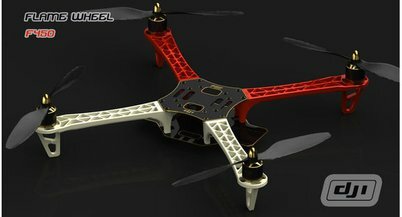 The Raspberry Fly is based on a DJI F450 Flame Wheel ARF kit. There are however many other possibilities. As you can see a quadcopter is (not surprisingly) equipped with four arms and a motor at the end of each arm. The basic principle is that each motor creates lift by spinning its propeller so by spinning all four propellers the quadcopter can create enough lift to take off. 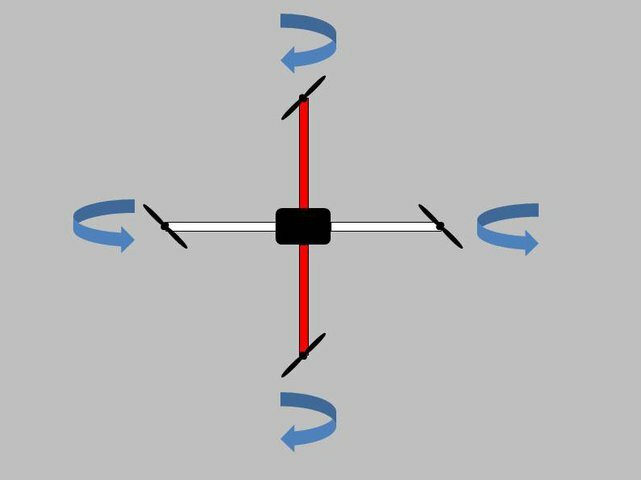 Since a quadcopter doesn't have a tail rotor like a helicopter, it is important that 2 propellers rotate clockwise and 2 propellers rotate counter clockwise as shown above. This is to prevent the quadcopter from spinning uncontrollably around its own axis (yaw-axis). When assembling your frame also make sure that the propellers are put on correctly so that they create lift when spinning instead of pushing the frame down. The Raspberry Fly uses brushless motors running on DC. Brushless motors are small and powerful. They have higher torque and can spin faster (higher peak RPM) than nitro and gasoline engines. You don't need to know about brushless motors in detail, but if you would like to read up on them you can do so here. The flight controller on the Raspberry Fly is a Raspberry Pi model B. It uses the GPIO pins to connect to the flight instruments and the PWM driver. You can buy these separately or even better you can get them together on an Inertial Measurement Unit (IMU). Some IMU's have only a gyroscope and an accelerometer, and some also have a magnetometer. The Raspberry Fly uses an AltIMU-10 V3 with gyroscope, accelerometer, magnetometer, barometer and thermometer.